A wide margin separates Miss Rose de Lago from Azkadellia in betting but trainer Danny O’Brien says a weight swing will bring the pair closer in Saturday’s Group 1 Queen of the Turf Stakes (1600m) at Randwick. Azkadellia is the $3.50 favourite while Miss Rose de Lago is a $15 chance in Queen of the Turf betting but O’Brien said the pair’s meeting in the Group 3 Mannerism Stakes (1400m) is a key form reference. The Doncaster Mile placegetter Akzadellia defeated O’Brien’s charge Miss Rose De Lago by a neck with the advantage of a 3kg weight pull in the Mannerism Stakes but the mares will meet on level terms in the weight-for-age Queen of the Turf Stakes. "She lines up well with Azkadellia. They met earlier in the autumn and we gave her 3kg and got beaten a neck,” O’Brien said. The Mannerism Stakes was Miss Rose de Lago’s first run of her autumn campaign. O’Brien said the daughter of Encosta de Lago was slightly disappointing when fourth in the Matron Stakes (1600m) at Flemington before her strong win in the Group 2 Sunline Stakes (1600m). However, O’Brien said Miss Rose de Lago would be even fitter for Saturday’s $1 million event. 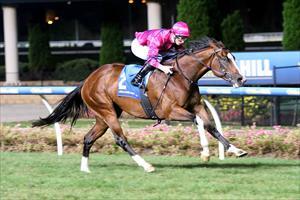 "She was slightly disappointing second-up but there were probably a couple of little reasons for that but the run improved her and she showed that at Moonee Valley,” O’Brien said. O’Brien completed Miss Rose de Lago’s training for the Queen of the Turf Stakes with right-handed gallops at Werribee last Saturday and Flemington on Tuesday but said the condition of the Randwick track could prove to be the former WA mare’s biggest problem on Saturday. "I’m really unsure,” O’Brien said. "She’s drawn (barrier) eight so she’s going to get her chance to go wherever (jockey) James (McDonald) thinks is the spot to be.